Clogged gutters – a common issue with gutters and downpipes which is preventable, but potentially serious, if neglected. Vegetation build-up will eventually block the passage of water, which can then overflow on to building elements. This may lead to penetrating damp. Drainage pipe cracking – caused by influences like rats, roots and corrosion. Pipe cracking can lead to property damage through water ingress, particularly if the problem is situated close to the building. Increased water content in the soil can lead to subsidence, if left unrepaired. 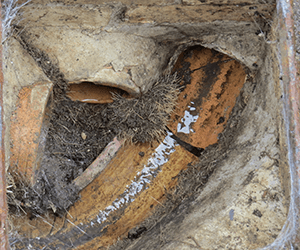 Drainage pipe cracking – as above, though issues in this regard are compounded by the foul nature of the contents. Cracking can lead to the escape of both water and solids, resulting in bad odours, soil pollution and potentially the spread of disease. Every homeowner and tenant should be aware of the drainage system of their property. A quick walk around the plot should reveal the location of inspection chambers and the advice of a surveyor can shed more light on the likely routes, if required. Ideally, the homeowner will inspect their drains at least once a year by lifting the manhole covers. Any blockages or material build-up should be unclogged and washed down with a hose or removed altogether and disposed of. A septic tank may well require emptying once a year. An inspection via the hatch will probably not reveal any pipe cracking. Any suspicions that there might be a leak – perhaps resulting in localised wet patches, foul smells or cracked walls – should be followed by a call to a drainage expert, who can undertake a CCTV survey of the drainage system to find the fault. Checking the manhole covers themselves for structural safety is very important, especially where people may walk over them. Indeed, above a septic tank, this maintenance could stop you falling up to your neck in poo! Where possible, rectifying a cracked pipe should be achieved without digging – i.e, without serious excavation. These methods include ‘cured-in-place’ pipes, which date back to the 1970s. An inverted tubular type material which is saturated in resin is inserted into the pipe. An inflatable device is used to expand the material and the resin is activated using either water or ultraviolet light. Once the resin has cured, the inflatable device can be removed and the material left behind acts as a secondary impermeable layer – allowing the drainage system to function normally. Excavation would be required in extreme situations, which is both disruptive and expensive. The best way to avoid this outcome is diligent maintenance and routine inspections – catching a fault early can often save you thousands.